I am a complete Ravelry sl*t. I have left my blog readers in the dust by only posting my store updates on the A Verb for Keeping Warm Ravelry group. Forgive me Readers! Where is that nun when I need her to whack me on the knuckles with her ruler? But really, I never had my knuckles whacked as a child. I did attend Catholic grade school. But they fired all of the nuns when I was in kindergarten. So, I can't even blame the nuns for my bad behavior. Maybe it was the lack of nuns that has instigated my bad behavior. As a kindergartner, I was sad to see the nuns go. I have always had a special affinity for almost extinct uniforms. The habit, the kimono, the sari is slowly moving into that category. Back on topic, I updated the store this week with some lovely flax/wool spinning fiber. 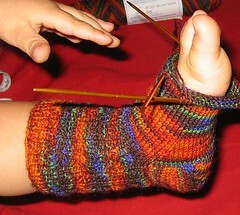 If you are on Ravelry, please come on over and join our group. Here I post about the Wednesday store updates (on time), customer appreciation sales, and about upcoming classes and shows. I have so much to tell you but it is going to have to wait for another day. I need to get back to tying my scarf. Tomorrow, is part two of the workshop, the indigo dyeing portion. Also, in August, my plan is to create and release my fiber club. Soon! What kinds of fiber would interest you? umm... everything! Please add me to your fiber club list. I met you at Lambtown and bought some of your beautiful merino/silk and camel/silk. My friends and I were testing out all of the spindles next door at Carolina Homespun when you came over to get your new spindle. Glad you came to our little fiber fair! I'm sorry I missed you at Lambtown -- didn't get there this year. The flax looks lovely. I'm spinning hard to make room for more. Hooray! A fiber club I can get in on BEFORE it goes big! Maybe? I would love anything you dye, but I'd like to see some plant fibers as well as animal fibers. Seems like lots of fiber clubs are all sw merino or BFL (not that those aren't nice, but something different is good every now and then). Fiber club would be perfect! It would enable me to have a steady flow of a verb fantastic-y goodness. Count me in. Fiber club!!! That makes me so happy. I'm sure you will come up with lots of interesting things to send out. Pretty much everything you come up with is gorgeous! Ooooh a fiber club. It would definitely be interesting if you could include same color/dye process with different fibers in the same shipment to show how different proteins absorb the dye differently. I'd definitely be interested in the more unusual fibers ... that would really make it different than the other clubs out there.